TEL AVIV – Israel was informed of the U.S.-led military strikes in Syria ahead of time, Israeli and American officials confirmed on Saturday morning. In a joint operation with the UK and France, chemical weapons sites, including a storage facility and a research base, were targeted in the pre-dawn hours, constituting the largest military intervention since the Syrian civil war began. The military assault was a response to the chemical weapons attack on the Syrian town of Douma last week in which 42 people died and many others were left gasping for breath and foaming at the mouth. He added that the strikes were an appropriate response to the “murderous actions” of the Assad regime. “Last year, President Trump made clear that the use of chemical weapons crosses a red line. Tonight, under American leadership, the United States, France and the United Kingdom enforced that line,” the official said. “Syria continues to engage in and provide a base for murderous actions, including those of Iran, that put its territory, its forces and its leadership at risk,” the official added. A spokesperson for the U.S. embassy confirmed that Israel was informed of the action ahead of time. “This morning, under American leadership, the United States, France and the United Kingdom demonstrated that their commitment to the fight against chemical weapons is not limited to declarations,” he said. 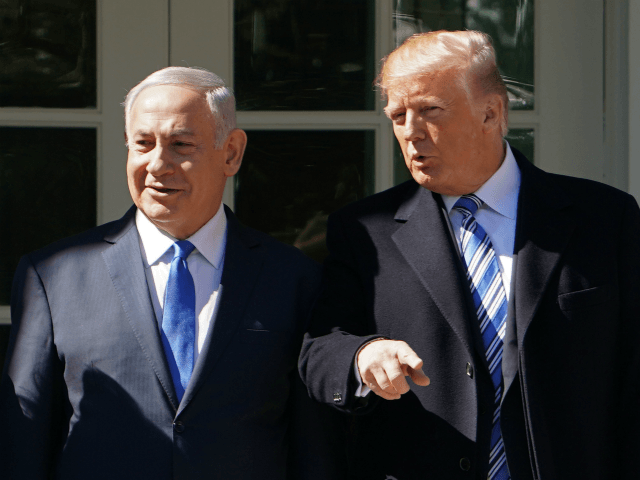 Netanyahu continued, “Trump’s resolve and Israel’s support remain unchanged” since last year when the U.S. conducted strikes in the war-torn country after a sarin gas attack. “It should be clear to President Assad that his reckless efforts to acquire and use weapons of mass destruction, his wanton disregard for international law and his provision of a forward base for Iran and its proxies endanger Syria,” the prime minister said. Nevertheless, the strikes were designed to set back Syria’s chemical weapons program “for years,” according to a senior Pentagon official, Lieutenant General Kenneth McKenzie. “The evil and despicable attack left mothers and fathers, infants and children thrashing in pain and gasping for air. These are not the actions of a man. They are crimes of a monster instead,” Trump said.